I always enjoy reading books or articles on places I've traveled and perusing the recent article on Corsica in Travel & Leisure was no exception. It's always great to see a country through the eyes of someone who has roots in the land, as the author does. As you know, I've posted on Corsica a couple of times already and have written many magazine articles, all focusing in on the off-the-beaten-track travel and hidden treasures that are my specialty. Since I noticed the T + L article didn't deal with one of my favorite haunts in Corsica, I wanted to share this unforgettable region with you. The Balagne region of Corsica may be France's best-kept secret. This mountainous area in the north of this island is dotted with hilltop villages that snuggle against the backdrop of jagged peaks. In fact, detouring from the much-loved coastal resorts is a must for those who want to find the Corsica of centuries ago. Many of these villages date back more than 1,000 years and yet these are active communities where artisans and crafts people thrive. Driving the Routes de Artisans along the wiggly roads that wind through this land of olives and vines, I met an array of personalities producing glassware, pottery, wine, olive oil, honey, almond biscuits, chestnut cakes, knives and aromatic oils. For example, Helene Cancela, a jeweler near the seaside town of Ile Rousse, etches bronze and sets semiprecious stones with healing properties in silver, creating organic works. Outside Calenzana, Rony Annick weaves olive branches, myrtle and bamboo into all manner of traditional baskets. Calvi’s knife maker, Patrick Martin, originally a sculptor, forges knives that are works of art. Don't be surprised when you enter his shop and see it decorated with animal skulls, since he delicately fashions the handles from antelope, goat and even boar horns or skulls. Carole Fanet, a potter in Algajola, produces contemporary works that are influenced by her travels in Asia. But, probably the heart of this artisanal area is Pigna, the music town, as it's known. No wonder, considering this hamlet became the center to resurrect Corsican traditions, including paghjella singing, and playing the cetera, a lute-like instrument that people from all over Europe now order from Pigna. Every July during the Estivoce festival that virtually takes over this hamlet, visitors can experience five days of theatrical and musical productions. 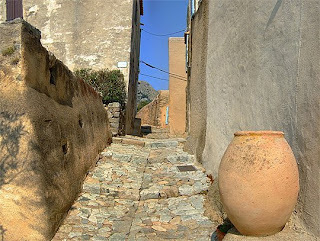 I wandered the narrow cobbled lanes and met women making wooden music boxes that play traditional Corsican lullabies; in another shop, Mr. Quilichini produces earthenware works that are inspired by Genoan pottery, which divers found off Corsica’s coast. Herve specializes in contemporary Asian-inspired, etchings as well as 18th century copper prints that he collects from antique shops. Among the most interesting items you can buy is one of Ugo Casalonga's ceteras made from walnut and cypress or Corsican flutes from goat horns.Among the most interesting items you can buy is one of Ugo Casalonga's ceteras made from walnut and cypress or Corsican flutes from goat horns. In Casa Savelli, Dominique Giantini sells locally made items, such as clementine marmalade, myrtle vinegar and chestnut flour cakes. The hamlet has three restaurants, all serving local products. Casa Musicale is a stone dwelling that combines a thriving music center and a lovely inn that's decorated with an array of authentic items, including a handmade harpsichord. Lunch and dinner is served in the barrel-ceilinged stone dining rooms that are housed in the original olive oil mill. The terrace perched on the hillside is much sought after during mealtime to catch views of the Algajola Bay. U Palazzu is a 400-year-old villa that's been in the Franceschini family for generations. Their fine restaurant, serving dishes that include grilled sea bass with risotto and artichokes and prawns with pumpkin sauce, is also housed in a former olive oil mill, where two centuries-old presses are still present. Finally, A Casarella serves up organic cuisine that focuses in on tapas, such as anchovy filets, sheep's milk cheese and mashed chickpeas with olive oil. Their dining room, dating from the late 1700, was once an animal shelter. But most guests opt for the terrace seats to glimpse the fabulous sunsets. Hi Dave and Deb, I think you would totally love Corsica, particularly if you focus in, as I suggested, on the less-visited locales. 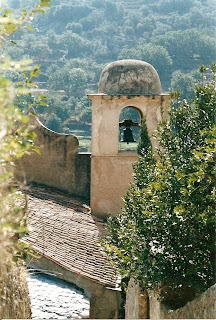 Check out my other Corsica postings for more ideas. I've seen Corsican musical instruments played in northern Europe, but didn't know this background. thanks. Hi Kerry, I became so enthralled with Corsican music that I bought a couple of DVDs when I was in the music town of Pigna. Reminds me of my trip every time I listen to them. Gorgeous photos. Makes me want to go pack my bags right now. Hi Christie, Thanks for visiting and commenting. I find everything about Corsica wondrous and lovely. You should plan a trip there in either the spring or fall when the crowds have dwindled and the temperatures are cooler. Hi Jennifer, I agree that the economy is making everything difficult, especially anything related to travel. I'm often on assignment when I travel, though. So where can I get an assignment? That winding road is calling to me. Gorgeous article, J.
Hi Vera Marie, Thanks so much for your positive feedback. 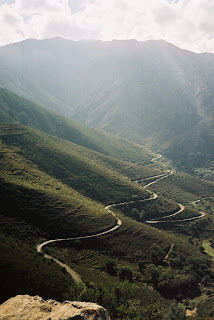 As it's raining here in New York, that winding road is calling to me, too.